Norwegian Air Shuttle ASA (OSE: NAS), trading as Norwegian, is the third largest low-cost carrier in Europe, the second-largest airline in Scandinavia, and the ninth-largest airline in Europe in terms of passenger numbers. It offers a high-frequency domestic flight schedule within Scandinavia and Finland, and to business destinations such as London, as well as to holiday destinations in the Mediterranean and the Canary Islands, transporting to over 30 million people in 2015. As of July 2016, Norwegian operates 110 aircraft of which 100 are Boeing 737s and 10 are Boeing 787 Dreamliners, and is known for its distinctive livery of white with a red nose, with individual portraits of noteworthy Scandinavians on the aircraft's tail fin. Norwegian launched its long-haul operation in May 2013. The long-haul flights were intended to be operated by two fully owned subsidiaries, Norwegian Long Haul and Irish based Norwegian Air International (NAI), which has a unique Air operator's certificate (AOC) but shares branding and commercial set-up with the rest of the Group. Due to delayed approval of a Foreign Air Service Permit from the U.S. Department of Transportation for NAI however, all long-haul flights have been performed by the parent company under its original AOC, NAX. Many flights from the European bases are now operated by NAI, under its unique AOC, using the IBK ICAO code to distinguish these flights. These are operated using Norwegian's Irish registered aircraft. Crew bases for the long haul Boeing 787 fleet are at Bangkok Suvarnabhumi Airport, New York JFK Airport, London Gatwick Airport and Fort Lauderdale-Hollywood International Airport. Norwegian Air Shuttle (NAS) was founded on 22 January 1993 to take over the regional airline services produced by Busy Bee for Braathens in Western Norway. Busy Bee, founded in 1966, was a subsidiary of Braathens that operated a fleet of Fokker 50 aircraft for charter. This included the network of regional services between cities on the west coast of Norway operated on wet lease for the mother company. Following the bankruptcy, NAS took over three leased Fokker 50 aircraft, and started operating from Bergen Airport, Flesland to Haugesund Airport, Karmøy, as well as from Bergen to Molde Airport, Årø or Kristiansund Airport, Kvernberget, and onwards to Trondheim Airport, Værnes. The company was established and owned by former Busy Bee employees and initially had a workforce of fifty. It was based in Bergen, but later established a technical base in Stavanger. On 7 January 2002, NAS took over the responsibility for the route from Stavanger to Newcastle, flying two round trips per day. This was the first route where the airline did not wet lease the aircraft to Braathens, but instead operated the route on their own risk. After Braathens was bought by Scandinavian Airlines System (SAS) in November 2001, all the contracts for the routes on the Norwegian west coast that Norwegian had with Braathens, were cancelled by SAS, who wanted their subsidiary SAS Commuter to take over. NAS had an 18-month cancellation period in their contract with Braathens, however this was not respected by SAS, who terminated the contracts without any notice. Following the decision by SAS to purchase Braathens, and the subsequent termination of all the contracts between Braathens and NAS, NAS announced in April 2002 that it would start domestic scheduled services as a low-cost carrier on the most busy routes. From 1 September 2002, the airline re-branded as Norwegian. The airline opened their second hub at Warsaw Frederic Chopin Airport in Poland, flying to Central European destinations. There were two Boeing 737 operating from Warsaw. The base was closed in 2010. Norwegian Air Shuttle ASA announced 24 April 2007 that they had bought 100% of the Swedish low-cost airline FlyNordic from Finnair plc; becoming the largest low-cost airline in Scandinavia. As payment for the shares in FlyNordic, Finnair got a 5% share stake in Norwegian. In February 2008 Norwegian announced their first destination outside Europe, non-stop to Dubai from Oslo-Gardermoen and Stockholm-Arlanda. After the bankruptcy of competitor Sterling Airlines, Norwegian announced that they would open a new hub at Copenhagen Airport and service the most profitable routes. Flights to Aalborg and Stockholm as well as additional flights to Oslo would start immediately, with flights to London, Amsterdam and Rome to follow "shortly after". On 30 August 2007, Norwegian ordered 42 new Boeing 737-800 aircraft, with an option for 42 more, an order worth US$3.1 billion. This order was later increased by 6 aircraft in November 2009. In July 2010 15 of the options were called, and in June 2011 15 more options were called, bringing the total order of new, owned 737-800's to 78 aircraft with 12 remaining options. Additionally, Norwegian introduced leased Boeing 737-800 aircraft into the fleet. The first leased 737-800 arrived at Oslo Airport, Gardermoen, Norway, on 26 January 2008. It was registered LN-NOB, and has a tail picture of the Norwegian composer Edvard Grieg. The plane made its first scheduled flight on 1 February. As of August 2013, the number of leased 737-800 aircraft has increased to 29. The first owned 737-800 from the 30 August 2007 order, registered LN-DYA, arrived in Oslo in August 2009. This aircraft was given the tail hero of Norwegian artist Erik Bye. In October 2009, Norwegian announced it intended to start flights from Oslo to New York City and Bangkok, requiring new intercontinental aircraft. In 2010, it said it was considering up to 15 intercontinental destinations from Scandinavia, and would also consider services to South America and Africa. On 8 November 2010, Norwegian announced that it had contracted to lease two new Boeing 787 Dreamliners from International Lease Finance Corporation, with delivery in 2012, and that it was negotiating the leasing of additional aircraft. On 25 January 2012, Norwegian announced the largest order of aircraft in European history. The order consists of 22 Boeing 737-800 and 100 Boeing 737 MAX 8 with an option for another 100 for the latter. Also, it included an order for 100 Airbus A320neo and an option for another 50 Airbus A320neo. In late October 2012, the airline announced a new base in London Gatwick from spring 2013 with three Boeing 737-800s to be used on new international routes from London to leisure destinations in Spain, Portugal, France, Italy and Croatia. All announced routes are flown in competition with airlines like easyJet, Monarch, Ryanair and Thomson Airways. Gatwick is also served by Norwegian from a large number of cities in Scandinavia. Norwegian is a member of European Low Fares Airline Association. Norwegian serves Europe, North Africa and the Middle East for both business and leisure markets. In total the airline operates 416 routes to 126 destinations in 35 countries on four continents. Domestic, intra-Nordic and typical European business and leisure destinations have the most service. 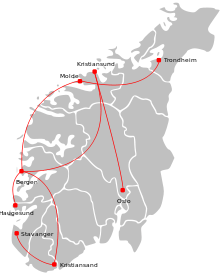 The busiest routes in Norwegians network are the Oslo to Bergen and the Oslo to Trondheim routes with 15 daily round-trips. Norwegian’s largest non-Scandinavian operation is to London Gatwick with up to 24 daily round-trips. Norwegian started long-haul flights on 30 May 2013. The first scheduled flights are from Oslo and Stockholm to New York City and Bangkok, originally with wet-leased A340-300 aircraft while the airline awaited delivery of the new Boeing 787 Dreamliner aircraft. In March 2013 Norwegian Air Shuttle confirmed a new long haul route from Copenhagen, Oslo and Stockholm to Fort Lauderdale, beginning on 29 November 2013. In September 2013, Norwegian announced flights from Oakland to Stockholm and Oslo, beginning in May 2014, as well as Copenhagen-Los Angeles, Copenhagen-New York City, Stockholm-Los Angeles, Oslo-Los Angeles, Oslo-Orlando and Bergen-New York City (JFK). Norwegian Long Haul also operates to New York City (JFK), Fort Lauderdale and Los Angeles from Norwegian's long-haul hub at London Gatwick. The airline announced in April 2015 the beginning of flights to San Juan, Puerto Rico (US Territory) from Oslo, Copenhagen, Stockholm and London Gatwick beginning in November 2015. Also announced were flights to St. Croix, US Virgin Islands from Copenhagen beginning in November 2015. In December 2015 the airline announced new routes from Boston to Oslo, London-Gatwick, and Copenhagen, starting March 2016. The airline announced in February 2016 new routes from Paris to New York City, Los Angeles, and Fort Lauderdale, beginning in July 2016. The airline also plans to serve Delhi, Durban, Cape Town and Hong Kong soon. In October 2015, Norwegian confirmed that long haul flights from Copenhagen Airport (CPH) to São Paulo, Rio de Janeiro, and Buenos Aires, may be started once more of the 32 ordered Boeing 787 Dreamliner aircraft are put in service. Intra-Scandinavian routes, and in particular "the capital triangle" between Oslo, Stockholm and Copenhagen, is attractive due to extensive traffic for both business and leisure travellers. Other modes of transportation are generally slow between these cities. In 2016, Norwegian Air Shuttle received 17 new Boeing 737-800s, 4 new Boeing 787-9s, and 2 Airbus A320neos. For 2017 the company will receive 17 Boeing 737-800s, 6 Boeing 737 MAX 8s, 9 Boeing 787-9s, and 6 Airbus A320neos. From 1993 to 2002, the company solely operated Fokker F-50 turbo-prop aircraft primarily as a commuter airline, having a total fleet of six in 2002. The company ceased all F-50 operations at the end of 2003 in order to focus on the Boeing 737-300 jet operations and sold the last three of the Fokker F-50 in early 2004. For a limited period in the early years of the 737 operation Norwegian operated a 737-500 as an interim solution while waiting for 737-300 deliveries. Following the acquisition of Swedish low cost airline FlyNordic in 2007, Norwegian inherited eight MD-80 aircraft. The last of the MD-80 aircraft was phased out two years later. Norwegian's aircraft livery is white with a signal red nose. Slightly further down the aircraft is a dark blue line. The vertical stabilizer of the aircraft in Norwegian's fleet is either white with red and dark blue lines at the top with white Norwegians titles in the blue or features depictions of historically significant Norwegians, Finns, Danes, and Swedes. Norwegian has also operated a single aircraft in a special promotional livery for the insurance company Silver. All flight operations are performed under one single air operator's certificate (AOC) (ICAO airline designator NAX). The Group also held a Swedish AOC (ICAO airline designator NDC) up until 2009, but the double AOC operation was discontinued for efficiency purposes. The main technical base is at Stavanger, although heavy maintenance (C/D checks) and engine maintenance are put out on tender. Norwegian contracts out all aircraft ground handling to third party companies. Norwegian, as a low-cost airline, operates aircraft with all-economy class seating. Surcharges are taken for on-board food and drinks, check-in baggage, payment by credit card and other non-core services. Norwegian also offers free WiFi on most of the services operated by its 737-800 fleet, but not on its 787 aircraft. In 2009, Norwegian CEO Bjørn Kjos received the annual leadership's prize "Kunsten å lede" from Manpower Inc. and HR Norge. Kjos was also awarded the Ernst & Young Entrepreneur of the Year Award for Norway in 2009. Norwegian's policies have also been criticized by passengers who were left without food, drinks and blankets on board for up to 12 hours (available for pay but only with correct type of credit card). In August 2014, 35,000 people were reportedly hit with delays when flying with Norwegian, and 1,200 passengers ultimately sued Norwegian for compensation. Between 2011 and 2013, Norwegian Air Shuttle (NAS) has received harsh criticism regarding its treatment of employees. The media first reported NAS's announced intention to open a base in Helsinki, from where it hired pilots on short-term contracts (in Estonia) rather than as employees within the company. 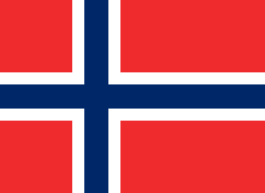 The Norwegian tax-office authorities suspected in August 2012 that many Norwegian citizens were working for NAS on these contracts and not paying Norwegian taxes despite operating on flights originating from Norway. In the fall of 2012, NAS started to use contract-employed pilots on routes within Scandinavia, which was considered by the NPU to be an abrogation of labor terms regarding non-Scandinavian pilots on routes within Scandinavia. NPU soon after sued NAS. In October 2013, the NPU announced their intention to strike as NAS forced its pilots to face dismissal or transfer to Norwegian Air Norway or Norwegian Air Resources AB, both subsidiaries of NAS. The respective subsidiary would then lease the pilots back to NAS. NPU and their Swedish counterpart SPF accused NAS of using this ploy to break the solidarity and organization of the pilots, with the eventual goal of co-ercing pilots to converting their jobs to contract positions. In mid-December, NAS faced its Swedish non-contract flight-attendants with either dismissal or transference to Proffice Aviation, an external staffing company. According to the Swedish cabin-crew union, Unionen, it managed to save the jobs of 53 NAS employees, but it was dissatisfied with the direction NAS had taken. The situation led to the leader for the Swedish Left Party, Jonas Sjöstedt, to state that stricter regulation is needed for the use of staffing-companies in Sweden. Norwegian has also been criticised for the terms of its contracts with its long-haul flight-attendants on contracts based in Thailand. This has caused the Air Line Pilots Association to further accuse Norwegian of unfair competition practices. ↑ "Norwegian Air Shuttle på ruinene etter Busy Bee" (in Norwegian). Norwegian News Agency. 27 January 1993. ↑ Valderhaug, Rune (28 January 1993). "Nytt selskap flyr fra Bergen". Bergens Tidende (in Norwegian). 1 2 Larsen, Trygve (13 October 2000). "Vil fly selv". Dagens Næringsliv (in Norwegian). ↑ Valderhaug, Rune (20 January 1994). "Braathen vil ikke fly direkte Bergen Nord-Norge" (in Norwegian). p. 6. ↑ Sæthre, Lars N. (24 August 1996). "Nye aktører kjemper om Widerøe-nett". Aftenposten (in Norwegian). p. 27. 1 2 "Norwegian Air Shuttle kjøper Lufttransport AS" (in Norwegian). Norwegian News Agency. 2 June 2000. ↑ Lillesund, Geir (15 November 2000). "Braathens fortsetter omleggingen – kutter kortruter" (in Norwegian). Norwegian News Agency. ↑ Larsen, Trygve (11 January 2002). "NAS inn for landing". Dagens Næringsliv (in Norwegian). ↑ "Directory: World Airlines". Flight International. 10 April 2007. p. 57. ↑ "Quarterly report 3rd quarter 2006" (PDF). norwegian.no. ↑ Norwegian to strengthen Scandinavian network with FlyNordic acquisition ATW Daily News, 25 April 2007. ↑ "Photo Norwegian Air Shuttle Boeing 737-8FZ LN-NOB". Retrieved 10 May 2015. ↑ "Photo Norwegian Air Shuttle Boeing 737-8JP LN-DYA". Retrieved 10 May 2015. ↑ Kaur, Simmi (5 October 2010). "Norwegian åpner ny base". Aftenposten (in Norwegian). Retrieved 5 October 2010. ↑ "Norwegian åpner base og satser innenriks i Finland" (in Norwegian). Norwegian Air Shuttle. 5 October 2010. Retrieved 5 October 2010. ↑ Kaspersen, Line (22 September 2010). "Norwegians "hemmelige" langdistanseplaner". Dagens Næringsliv (in Norwegian). Retrieved 5 October 2010. ↑ Kaspersen, Line (8 November 2010). "Her er Norwegians New York-fly". Dagens Næringsliv (in Norwegian). Retrieved 5 October 2010. ↑ Ekroll, Henning Carr (25 January 2012). "Norwegian kjøper fly for 127 milliarder kroner". Aftenposten (in Norwegian). Archived from the original on 25 January 2012. ↑ "Management". Norwegian Air Shuttle. Archived from the original on 15 August 2009. Retrieved 5 March 2010. 1 2 Schmidt, Øystein (25 February 2010). "Kjos klinker til med realt kupp". Hegnar Online (in Norwegian). Retrieved 4 March 2010. ↑ Home page. Norwegian Air Shuttle. 13 January 2008. Retrieved on 7 May 2010. "Norwegian Air Shuttle – Postboks 115, 1330 Fornebu – Besøksadresse: Oksenøyveien 10A Fornebu." 1 2 3 4 5 6 7 "Annual Reports". Norwegian Air Shuttle. Retrieved 10 December 2011. ↑ "The Year in Brief". Norwegian Air Shuttle. Retrieved 10 December 2011. ↑ "Norwegian Annual Report 2012 - the year in brief". 20 March 2013. Retrieved 20 May 2013. ↑ "Norwegian Q4 2013 Presentation" (PDF). Retrieved 21 March 2013. ↑ "Norwegian 2014 Annual Report" (PDF). Retrieved 2 January 2016. ↑ "Norwegian 2015 Annual Report" (PDF). Retrieved 9 June 2016. ↑ "Kjos sendte første fly til New York" (in Norwegian). e24/NTB. 30 May 2013. Retrieved 24 June 2013. ↑ AF Ole Kirchert Christensen (2013-03-14). "Til Florida for 3.000 kroner (opd.)". Check-in.dk. Retrieved 2013-05-06. ↑ "Cheap Oakland flights put Norway, Sweden in reach". SFGate.com. 4 September 2013. Retrieved 27 August 2015. ↑ "Norwegian Air eyes new Asian routes". NewsInEnglish.no. 3 July 2014. Retrieved 27 August 2015. ↑ "Norwegian eyeing new long range flights out of Copenhagen". cphpost.dk. 12 October 2015. Retrieved 31 May 2016. ↑ Train travel times 2014: Stockholm-Oslo 5:55, Stockholm-Copenhagen 5:15, Oslo-Copenhagen from 7:00, according to ResRobot - Find the best connection from door to door. ↑ "Our Aircraft". norwegian.com. Retrieved 13 November 2016. ↑ "Utdrag luftfartøyregisteret inkludert månedlige endringer". Retrieved 10 May 2015. ↑ "Norwegian selects 30 A321LR for first transatlantic routes". Retrieved 2016-07-21. 1 2 3 4 5 "Fleet". Norwegian Air Shuttle. Retrieved 5 March 2010. 1 2 Airfleets. "Boeing 737 in Norwegian Air Shuttle history". Retrieved 17 September 2009. ↑ Airfleets. "Fokker 50 in Norwegian Air Shuttle history". Retrieved 17 September 2009. 1 2 Airfleets. "McDonnell Douglas MD-80/90 in Norwegian Air Shuttle history". Retrieved 17 September 2009. ↑ "Max Manus halehelt på Norwegians nyeste fly". Boarding.no (in Norwegian). 11 March 2010. Retrieved 11 March 2010. ↑ "Silver og Norwegian har inngått et nytt og spennende samarbeid: Lanserer Norges første logojet" (in Norwegian). Norwegian Air Shuttle. 14 September 2006. Retrieved 11 March 2010. ↑ "Service". Norwegian Air Shuttle. Archived from the original on 5 July 2009. Retrieved 5 March 2010. ↑ Ravnaas, Niels Ruben (23 May 2013). "Nå gir også Norwegian bonuspoeng" (in Norwegian). NA24. Retrieved 23 May 2013. ↑ "In-flight WiFi". Norwegian Air Shuttle. Retrieved 11 February 2013. ↑ Are Slettan. "Kjos årets leder". Nettavisen. Retrieved 10 May 2015. ↑ AirlineRatings (2013-11-06). "Airline Ratings". Airline Ratings. Retrieved 2014-01-17. ↑ "Norwegian is announced as the Best Low Cost Airline in Europe at the 2013 World Airline Awards". Worldairlineawards.com. 2013-06-18. Retrieved 2014-01-17. ↑ "Europe's Leading Low-Cost Airline 2015". World Travel Awards. ↑ "Air New Zealand Airline of The Year". Retrieved 10 May 2015. 1 2 3 "APEX Hollywood Shortlist: Straight Outta Compton Nails B.O. Encore in Second Week at Number One - APEX - Airline Passenger Experience". APEX - Airline Passenger Experience. 1 2 3 Øyvind Gustavsen. "Nytt prisdryss over Norwegian". VG. Retrieved 10 May 2015. ↑ "Vant prestisjefull kåring igjen". dn.no. Retrieved 10 May 2015. ↑ "The 4th US ANNIEs – Chicago O'Hare and Delta Air Lines win big". anna.aero. Retrieved 10 May 2015. ↑ "Air Transport News". Retrieved 10 May 2015. ↑ "Norwegian Air complaints pile up". newsinenglish.no. 7 January 2014. ↑ "Norwegian Air Review: How My Dreamlines Experience Turned Into A Nightmare". thiswaytoparadise.com. 14 August 2014. ↑ "Norwegian airline backs down on water and cash policy". The Daily Telegraph. 20 June 2013. ↑ "Swedish passengers sue Norwegian airline". thelocal.se. 13 August 2014. ↑ Knut-Erik Mikalsen. "Klageflom mot Norwegian". Aftenposten. ↑ "Klageflom mot Norwegian". Bergens Tidende. ↑ Berglund, Nina (21 August 2012). "Pilots land on tax authorities' radar". Views and News from Norway (newsinenglish.no). Retrieved 22 December 2013. ↑ "Pilot-opprør mot Kjos". Dagens Næringsliv (in Norwegian). dn.no. 4 April 2011. Retrieved 22 December 2013. ↑ "Vi ansetter ingen i Norge". TDN Finans (in Norwegian). dn.no. 19 May 2011. Retrieved 22 December 2013. ↑ "Norwegian saksøkes av sine egne piloter". Dagens Næringsliv (in Norwegian). dn.no. 16 September 2012. Retrieved 22 December 2013. ↑ "Norwegian vil vingeklippe piloter før streik". Dagens Næringsliv (in Norwegian). dn.no. 22 October 2013. Retrieved 22 December 2013. ↑ "Piloter varslar om sympatistrejk". Svenska Dagbladet (in Swedish). Stockholm: TT/SvD.se. 31 October 2013. Retrieved 22 December 2013. ↑ Karlsson, Josefin (19 December 2013). "Norwegian säger upp kabinpersonal i Sverige". Aftonbladet (in Swedish). Aftonbladet.se. Retrieved 22 December 2013. ↑ "Parat: - Sosial dumping i Norwegian". NTB/Dagens Næringsliv (in Norwegian). dn.no. 30 October 2013. Retrieved 22 December 2013. ↑ "Flight Attendants". dn.no. 9 September 2008. Retrieved 10 May 2015. ↑ "Forsiden". dn.no. Retrieved 10 May 2015. Wikimedia Commons has media related to Norwegian Air Shuttle.